Aug. 10, 2018: Bullet holes riddle a window in an apartment building in Fredericton after a shooting that left a couple and two police officers dead. A suspect is in custody after a mass shooting on Aug. 10 at the Fredericton apartment complex where he lived, in which a couple and two police officers were killed. Matthew Vincent Raymond, 48, is charged with four counts of first-degree murder, and will be appearing in court on Aug. 27. Police confirmed that Mr. Raymond had a firearms license, and that the long gun used in the shooting was not a prohibited or restricted weapon. Police have not released details on possible motive or how the targets were chosen. No relationship has been established between Mr. Raymond and any of the victims, police say. The slain couple were identified as Donald (Donnie) Robichaud, 42, a musician, and Bobbie Lee Wright, 32, a homecare worker. The two officers killed were Constables Sara Burns, 43, and Robb Costello, 45. A regimental funeral is planned for both officers on Aug. 18, Fredericton police said. The two officers Mr. Morehouse saw were Constables Robb Costello and Sara Burns, the first two police on the scene. They had arrived at around 7:10 a.m., finding an adult man and woman lying motionless, before they themselves came under fire. More police came, locking down the neighbourhood and searching through its buildings. By 8:17, they tweeted confirmation of “multiple fatalities” in the shooting. By around 9:30, police apprehended the suspect, who had been wounded, and took him to hospital. 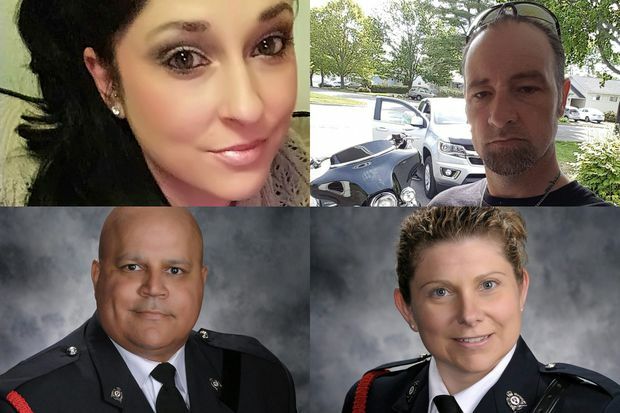 Clockwise from top left: Bobbie Lee Wright, 32; Donald Adam Robichaud, 42; Constable Sara Mae Helen Burns, 43; and Constable Lawrence Robert (Robb) Costello, 45. Bobbie Lee Wright: The 32-year-old Fredericton native was a homecare worker for the elderly – a very fitting vocation for her, "because she liked to care for other people,” her sister-in-law Emily Wright told The Globe and Mail. Her mother, Brenda, described her as a "peacemaker” between her two siblings who was polite and quiet growing up. Donald (Donnie) Robichaud: Family and friends of the 42-year-old musician described a passionate man who loved his three children, sons Zakkery and Draiden and daughter Chloe, whose names were tattooed on his neck. He had recently separated from his wife of 22 years, Melissa Robichaud, and announced his relationship with Ms. Wright with a blue heart on Facebook only days before the shooting. Constable Sara Burns: The 43-year-old joined her hometown’s police force in 2016, after deciding to go back to school for a criminology degree and an intensive six-month stint at a police academy in PEI. Edgar MacLeod, the academy’s former executive director, remembered her as being a capable student of the law: “You could tell she would treat everybody with respect, not a showboat, she didn’t have an edge.” She leaves a husband and three sons. Constable Lawrence Robert Costello: Fond of introducing himself as “Robb with two Bs,” Constable Costello was a 20-year veteran of the Fredericton police. Constable Costello, who planned to retire in six or seven years, had warned his family about the risks of his job, telling common-law partner Jackie McLean that he didn’t want a sad funeral if anything happened to him: “He wanted to have a true Irish wake and wanted to have a party with lots of laughs and happy memories," Ms. McLean said. He also leaves two daughters from a previous relationship, and Ms. McLean’s two children. Soon after the shooting, police identified the suspect as Matthew Vincent Raymond, 48. He had moved into the apartment building four months earlier, said Judith Aguilar, an office manager for the complex’s owner, Sunfield Apartment Rentals. Ms. Aguilar described him as an avid cyclist who paid his rent promptly every month: "He was always polite and pleasant." Brendan Doyle, former owner of the recently closed Read’s Newsstand & Cafe in Fredericton, said he knew Mr. Raymond and had asked him to stop coming by the coffee shop after he allegedly made inflammatory comments to patrons. No connections have been reported between Mr. Raymond and Mr. Robichaud, who lived in the same apartment complex, but in a different building. Family and friends of Ms. Wright also said they were not aware of any connection to Mr. Raymond. Aug. 11: Flowers, signs, and notes of condolence left by members of the community act as a vigil in front of the Fredericton Police headquarters. New Brunswickers: Frederictonians paid their respects with flowers and vigils at a makeshift memorial outside the city’s police headquarters. At the city’s Pride parade, two days after the shooting, events began with a moment of silence. Mayor Mike O’Brien said the parade was a way for residents to begin healing: “There’s a way to celebrate even in the midst of this grief." Law enforcement: For New Brunswickers, the Aug. 10 shooting brought back uncomfortable memories of a lone gunman’s 2014 rampage in Moncton, which killed three RCMP officers. “I can empathize with what these people are about to go through and hopefully they’ll have the support and some of the tools they need to get through it,” said Daniel Larche, whose brother Doug was one of the RCMP constables killed in Moncton. Police forces across Canada lowered their flags to half-mast on Friday in solidarity with Fredericton police, a force with only 127 officers and staff. Across Canada: Prime Minister Justin Trudeau paid tribute to the slain Frederictonians at a Friday street festival in Toronto’s Greektown, which was itself the scene of a mass shooting last month. Over the weekend, the Prime Minister visited families and colleagues of the victims in Fredericton, and laid flowers at the makeshift memorial. Charity: At least two GoFundMe pages were set up in the name of the victims' families, though Fredericton police said they had not been sanctioned by the officers' families. GoFundMe is reviewing the campaigns and says none of the money raised will be distributed until there is a plan for who receives it. Please be advised that the GoFundMe pages that are being promoted in the wake of Friday's shootings have not been sanctioned by the Costello or Burns families, or the FPF. Further information is forthcoming on charitable donations to the families and in the officers' memories.